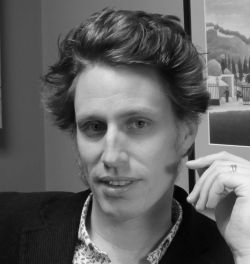 Stewart Cole is the author of the poetry collection Questions in Bed (Goose Lane, 2012). Recent poems have appeared in The Puritan and The Walrus. 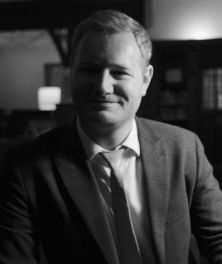 He is Assistant Professor of English at the University of Wisconsin Oshkosh, where he teaches modern British and Irish literature and creative writing. Jim Johnstone is a Canadian writer, editor, and physiologist. He's the author of four books of poetry: Dog Ear (Véhicule Press, 2014), Sunday, the locusts (Tightrope Books, 2011), Patternicity (Nightwood Editions, 2010) and The Velocity of Escape (Guernica Editions, 2008); and the subject of the critical monograph Proofs & Equational Love: The Poetry of Jim Johnstone by Shane Neilson and Jason Guriel. Currently, he is the poetry editor at Palimpsest Press, and an associate editor at Representative Poetry Online. He lives in Toronto. Is the total absence of sound perhaps exactly as far beyond our grasp as paradise? Jim Johnstone: I'd like to begin with the philosophical significance of the three title poems in Questions in Bed. You've spread them out over the course of the collection, and they set the tone for the book by acting as thesis statements. I love the dream-like quality you create by using the bed as your venue for truth seeking, as opposed to a church or classroom. The questions you ask are pointed, and you even go as far as to inquire of the reader, "Tell me, are these questions careening off / the ceiling with any force?" Can you comment on the importance of these poems in relation to the rest of the book? Stewart Cole: All three poems are twenty lines in ten couplets in sentences consisting strictly of questions, eschewing declaration. Because the collection proceeds as one long unit without section breaks, I see these poems as conceptual hinges of sorts. I've titled them all "Questions in Bed" and spread them evenly throughout the book to suggest the various kinds of questions that might keep one awake at night: the first one is a social poem, concerned with the specter of other people's suffering; the second is a (sort-of) love poem, more in keeping with what a title like "Questions in Bed" most immediately suggests; and the third is a poem about solitude and the possibility thereof. And these are the three poles between which, broadly speaking, the book ranges, with love residing in some elusive space between the social and the solitary. A cell falling in love with its own heat. SC: My first question for you is, I think, a similarly encompassing one. Patternicity is on the one hand (and as its title suggests) concerned with equational thinking: not only do a handful of poems in the collection take mathematical equations as epigraphs, but more generally, your work often seeks out correspondences, like the title poem's "axe searching for order in bands / of pine." On the other hand, however, your work teems with viscera: blood, bone, muscle. Put simply, your work mines a generative tension between the neatness of equational thinking and the raw vulnerability of living bodies. This is most explicit in the eight "Abattoir Ghazals" that end section 1-where formal regularity plays off against the messiness of the subject matter-but this push-and-pull is at work throughout Patternicity. Could you talk a little about how you see this tension operating, and the impetus behind it? JJ: I wrote the bulk of Patternicity while I was a doctoral candidate in Reproductive Physiology at The University of Toronto. In retrospect, my graduate work contributed to the visceral nature of the book in ways I didn't expect, as I spent my time away from poetry teaching human biology and quantifying placental enzymes (and if you've ever seen a placenta, you'll know it's a particularly bloody organ). Most of the poems in Patternicity began as scientific parables, some with equational epigraphs, and I hope ended up closer to something imbued with blood, bone and muscle. At the time I was interested in the parallels between the poetic process and the scientific method - from the formation of a hypothesis, through analysis, to the physical realization of an experiment (or poem). The "Abattoir Ghazals" are the most obvious example of my playing with the tension between abstract thinking and the physical world. The ghazal form lends itself well to disjointed narrative, with radical leaps between stanzas, and I wanted to make associative connections that might not be obvious to the reader. For example, the line "At touch, white oak and widowed moths can't remember / their selfish beginnings." came from my considering the contrast between paper and ink and likening it to moths who have evolved to change color in respect to their surroundings in order to survive. In this case, what you get is finished product without its generative spark, but when you take the lines that make up the "Abattoir Ghazals," they all point in one direction. Therein lies the tension that serves as the heart of the sequence, the same tension that's important in experimental design and part of what serves as a gateway to understanding the natural world. Under shadow of a grass umbrella at midday I wonder very little. JJ: Shane Neilson recently wrote that your "poetry is of the same cloth as thought." This is especially true of "1-1-9," a meditation on the realities of being a tourist in a tropical country. You balance so many emotions in that piece, all the while managing the internal monologue of a protagonist who's getting progressively drunker. Can you talk about some of the different voices you use in Questions in Bed, and the unreliability of the narrator in "1-1-9" who ends up fantasizing about a reverse emergency? SC: If the speaker of "1-1-9" is unreliable in a literary sense, it's because he's alert to his moral culpability as a tourist and therefore unsure, unstable in both a psychological and a verbal sense. He quavers. I've tried to have all the speakers in Questions in Bed embody this uncertainty; they are never sure of themselves, to the extent that their status as selves might in fact be called into question. And of course it should—both because uncertainty is our condition and because they're not in fact people but verbal constructs: experiments in sincerity, shimmering somewhere between artifice and authenticity, where I think poetry belongs. In reading recent poetry and poetic statements—at least in English, whether American, British, Canadian, whatever—one encounters a lot of poets praising themselves for their own attentiveness, whether to the world's 'small miracles' or some other hackneyed conception. But it seems to me that attentiveness requires paying equal attention to the flaws in one's own ways of thinking and living, rather than (as I see so often) feigning moral superiority by reveling in the pretty things and either ignoring or expressing empty indignation towards the ugly ones. Put simply, I want my speakers to inhabit doubt, to examine it, to hold it up like a faceted jewel and examine it from all angles. To diamond doubt. I can't remember a time when I wanted to be here. SC: I want to bounce off your last question to me by asking you about the speakers of Patternicity. Despite referencing a wide variety of locales (often in your native Ontario, but also Dallas, Paris, Hungary, China and more) and featuring characters widely dispersed in time (Biblical and mythic figures like Lazarus and Tithonus, scientists like Johannes Kepler and Frederick Banting, miscellaneous historical figures from Captain James Cook to Satchel Paige, plus something that gestures towards an autobiographical "I"), the collection possesses a remarkably unified voice. In fact, a poem like "Tithonus" — spoken by a character from Greek mythology cursed with unwanted eternal life - achieves much of its resonance not by adopting an idiosyncratic voice to represent the character's particular psychology (i.e., in the manner of most dramatic monologue), but through the way it infuses the characteristic voice of the collection with a cosmic scope, thus highlighting the range and adaptability of that characteristic voice, which often evokes for me a kind of timelessness. Can you talk a bit about how you conceive of Patternicity's "voice," and how you see a mythically inflected poem like "Tithonus" fitting into the collection? JJ: Your question reminds me of a line in Dan Beachy-Quick's introduction to Mulberry: "Poetry riddles oneself with oneself by weaving one voice into many." All the things you mention — the places, the people, the myths — are part of the voice I developed while writing Patternicity, and their presence is almost entirely autobiographical. That my voice is characteristic is intentional: it's many voices distilled into one. I like to think I decided on it the way a band making its debut decides on a sound. "Tithonus," despite its mythological backbone, is one of the most personal poems in the book. The impetus for the line you quote above is my first marriage, the failure of which haunts me despite my having forgotten almost everything about it. The breakdown of memory, or more specifically my inability to remember my own past, is what drew me to Tithonus. At a certain point, the culture of youth passes everyone by, and I sympathize with having to live in a time you're not equipped to understand. It's something I've felt happen as I've grown older, in a minor way at least, and I think that's what accounts for the timelessness of the myth. JJ: I feel comfortable personalizing myth in the same way I believe readers project themselves on what they read. To extend your last question a little further, did you consider an audience when you wrote the poems in Questions in Bed? If so, how much of your consideration was borne out in space left for the reader to insinuate herself in your work? SC: The notion of audience raises tricky questions. Auden (one of my select artistic and intellectual heroes, whose words often pop into my head when I'm confronted with such questions) defined poetic talent as "the power to make personal excitement socially available." This strikes very close to how I think about audience: I want desperately to communicate—but (and here's a catch) without having to communicate in the forms or modes that fashion or precedent set out for me. Whenever I've written something with even a hint of trying to lure acclaim or popularity (and really, who hasn't? ), the result has gone rightly unpublished. I believe that poetry can teach us new ways of living together, but only if its practitioners write as themselves — with the understanding, of course, that for some people 'writing as themselves' means donning masks or warping their voices or abandoning personhood altogether to give language to their own idiosyncratic urgencies. Despite all the claims to universality made of great poetry, I think there's a sense in which only the sum of these myriad idiosyncracies has any claim on the universal. We don't need poets trying to sound like each other. Getting back to my work specifically, my answer to this question relates to my answer to your first one, regarding the three "Questions in Bed" poems. That those are phrased as a series of questions — and that I gave them titular prominence in the collection — speaks to the fact that the driving impulse behind my work is apostrophic. I want to say something not just to myself, but to "you" — a second-person entity both singular and plural, intimate and communal, consisting of specific people I have in mind but also Otherness at large, without all of which "I" am just a cough in the dark. SC: To wrap up, I want to shift from the question of audience to the related one of difficulty. The line I've quoted above opens "What Lasts," the final poem in Patternicity. In reading this poem (and indeed much of the collection), I'm struck by your willingness to radically re- or even disorient your readers, often — as in the images of "Window open, insects cross / the gulf, osmose from cold / that can still the slap of wings" — through a stretching or telescoping of perspective. In other words, your work often challenges us with an awareness of the minute complexities that make up even our most common gestures and perceptions. I know this arises partly out of the physiological perspective we discussed earlier, but beyond that I'm wondering here about how you think more generally about the issue of poetic 'difficulty', how you yourself conceive of the challenges your work presents to readers, and why such challenges are important. JJ: I'm not concerned with difficulty as much as I'm concerned with perspective. There's always going to be a gap between what a poem means to its author and what a poem means to an individual reader — to me that adds a layer of perception that makes difficulty a secondary concern. Poetry demands the interpretive powers of its readers, and I'm comfortable leaving that challenge in their hands. This includes the shifts between the microscopic and macroscopic the pervade Patternicity. From a physiological standpoint, the telescoping of perspective you describe above mirrors the way human beings experience their surroundings. All you have to do is look up from the pixels of this computer screen to make the spatial leap from the window to the environment that contains it. Ultimately, it's the challenge of writing for myself while negotiating the needs of an audience that keeps me publishing. Without that privilege, I think most of my poems would have perished in a notebook long ago.